Need Cockroach Removal In Perth? The cockroaches found around Perth can be put into two distinct categories, (those that were introduced from overseas and those that are native to the South West). You need cockroach removal in Perth! The “lntroduced” qlecies include the notorious German roach, the slightly larger Brown-banded roach and the much larger American roach. These particular roaches are all disease carrying insects and inhabit areas in and around our homes. German roaches can number in their hundreds or even thousands if left to multiply. They are the smallest of all roaches found around Perth and are distinguished by two dark stripes running down their back. They are usually found in kitchen areas where they will inhabit fridge motors, microwaves, under jug stands and almost anything electrical that is left on for long periods of time such as phone chargers etc. German cockroaches have the remarkable ability to maintain development of their egg cases long after the actual roach has died. This can make total eradication difficult. 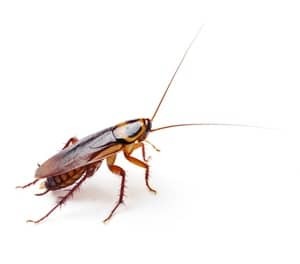 American roaches are the large red-brown flying ones that are commonly found in and around dark damp areas such as bores, drains, cavity walls and under concrete slabs. Being the largest of cockroaches found in the Perth area, their droppings are often mistaken by homeowners for mouse droppings, especially in kitchen cupboards. These roaches can spread diseases as well as salmonella poisoning. All the Introduced “species” of cockroach are covered under both our Pest Packages. We have an array of products such as specific baiting gels, dusting powders and residual sprays which are all suited for indoor use if necessary. The “Native” cockroaches found around Perth appear to be more abundant than ever. Every suburban street in Perth has literally thousands of these roaches under tree bark, behind palm fronds, under mulch, between sheets of fencing and under almost any external object. These are mostly the dark brown-black Wood roaches with one species in particular having a pale frill around its head. These roaches are prolific during the hot summer months when their usual supply of moisture tends to dry out making them agitated. It is during this time most homeowners notice them entering their houses for cooler air and moisture. Although it is impossible to completely control these roaches, most of our customers notice a huge drop in number long after having one of our Pest Packages.